Indonesia has seen an amazing growth in the number of investors to the country but it still isn’t very attractive — this country of 260 million people only has 1.025.414 investors. This spells out untapped potential to reach those who are not yet convinced to invest in Indonesia. This is where tanamduit comes in, as an easy to use fintech product for people to learn more about mutual funds. Users can also painlessly purchase mutual funds and maintain their investments on the same platform. Tanamduit is a digital platform that helps with financial planning, buying mutual funds and monitor the progress of their investments. Tanamduit helps newbies — those who are not sure how to invest — and can recommend products that fit their risk profile. Tanamduit is available on web, Android, and iOS platforms. 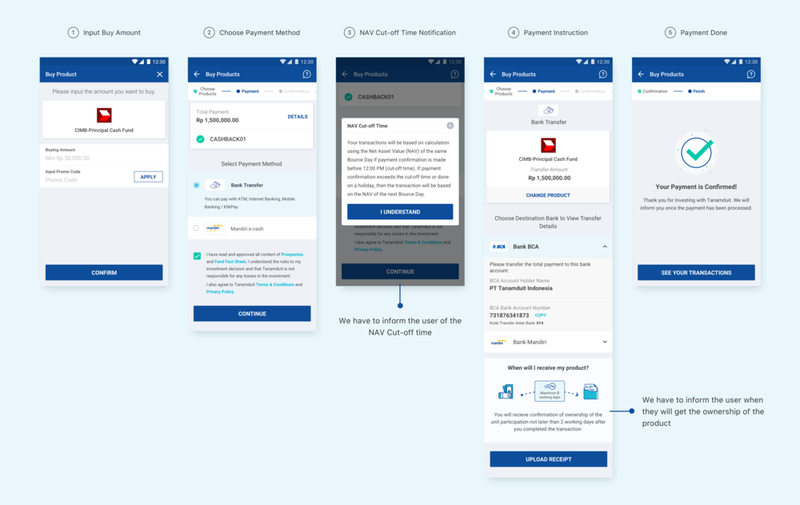 In this case study, I will share the design process for the app and how the Flolab team came up with solutions. Based on these problems, tanamduit realised their customers need a digital platform that can educate them and provide all the information needed to understand mutual funds. Ideally, the platform will also enable them to easily buy mutual fund products that match their financial goals and of course, where they can monitor their investments. Following that, the goal was to create a product that is user-friendly, not intimidating for beginners, and easy to use and understand by more experienced users — where they can buy and redeem mutual funds easily. 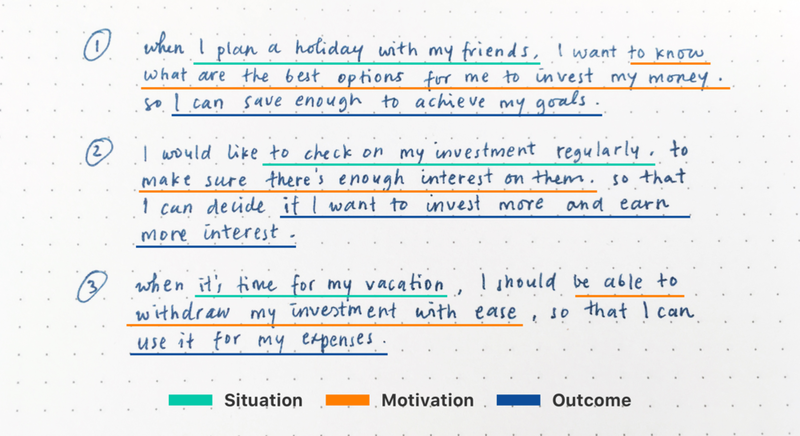 I wrote the following job story with the Jobs To Be Done framework to understand what will user do in the app. I created wireframes based on the sketches that I drew. We decided that the app will have 5 main tabs on the app: Dashboard, Portfolio, Create New Investment, Activity, and My Account. Creating wireframes helped me arrange the interface elements while I focused on the functionality rather than appearances. When presenting wireframes to clients, sometimes they are unable to understand what’s on the page because of it’s low fidelity and they often are too focused on the action of command buttons. So I created a high fidelity wireframe with click-able prototyping and incorporated some color to show important statuses. 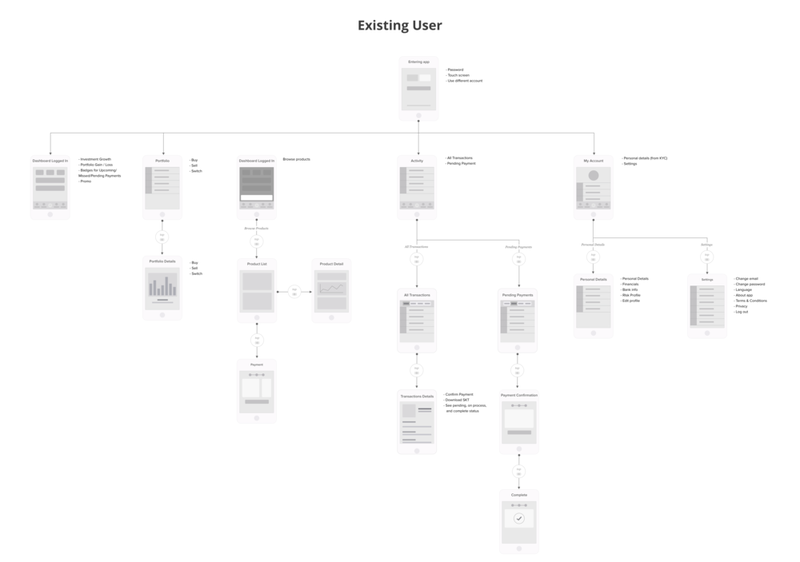 It is easier to present to clients a wireframe with clear and detailed information. Once the app was released we saw some great reviews for it on the Play Store. Having said that, we’re also aware there’s still room for improvement. Users want more features and more mutual fund products. We’re excited to continue working on the feedback coming in from tanamduit users and continue helping them buy mutual funds with ease. Overall I’m happy with the live results, even though I know we could have done few things better. I learnt a lot while designing this app, including deeper design skills and also more about the art of investing. I learnt how to build a product right from the start until the development stage and still continue iterating on it. When creating tanamduit I had to re-visit the flow multiple times to get the user experience right. Design can always be improved; it’s important to know when to ship and wait for user feedback in order to make further iterations. There are a lot of people out there like me who know nothing about investment, or others who are curious but clueless. I hope creating tanamduit can help a lot of people achieve financial freedom. The app is the first step towards your financial goals! The app and web platform are still developing and growing. Tanamduit plans to create more features to helps users, add more investment products, and improve the user experience. Shout out for the team that made this project come to life from tanamduit: Ferry Aprilianto — CTO, Sani Fathuddin — Product Development; and from Flolab: Ritika Bhagya — UX Director.